From deep in the jungle to high above the sharp mountainous rocks and raging rapids below, mankind builds bridges to cross to the other side. Some are outright treacherous, either extremely old, too narrow, too high, over sharp rocks, or a possible watery demise below. 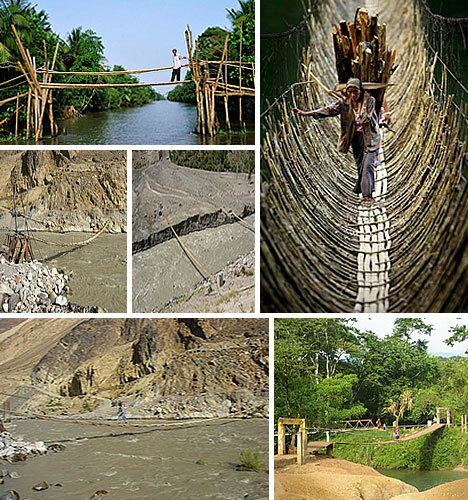 Despite bouncing along as the wind sways your walkway, or the sometimes breakable “floor” underfoot, some people use these dangerous bridges as a daily crossed pathway between remote villages. What if urban was only a remote memory and you must get across to the other side; would you pull a Tarzan and find a vine to swing across? How about if the bridge was made of vine? Sticks and stones, canes and roots, bamboo footpaths, can it get more creepy? Oh yes. Adventurers travel where they can cross from point A to point B via the most dangerous ways like swinging bridges, hanging bridges, rope bridges, no handrail available on some. 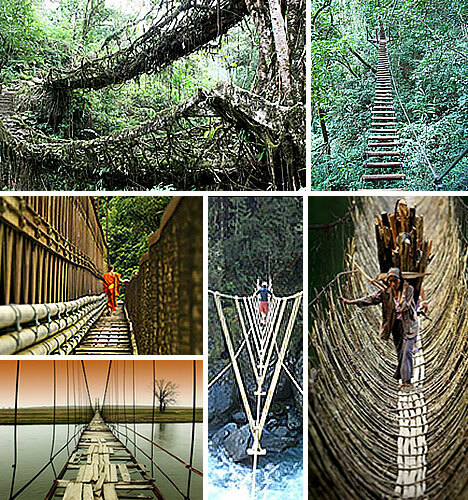 Here are 68 pictures of the most bizarre and perilous bridges around the globe. Without bridges to help us cross otherwise non-cross-able areas, we would thoroughly be SOL. Can you imagine crossing the rickety Hagwilget Bridge (middle right) in 1872? Would you swim then or take a boat? We need bridges. A woman still uses an earthquake damaged bridge (middle right) to cross the crumbled Chinese town of Hanwang. Although some bridges fall into disrepair, many bridges are truly dangerous to this day.Sometimes flood waters wash them away. Sometimes mankind decides they could improve upon their technology and call in demolition teams to clear out the old bridges.For kicks and giggles, adrenaline seekers should try out some of the bridges either by foot, by bike, or drive your car across if it will fit and you are daring enough to try it. There is a great amount of diversity in bridge types. Most of us have seen urban bridge architecture that is both beautiful and inspiring. There are bridges over tropical turquoise waters (middle left) that split as if you have a choice in directions. On an island off the coast of Spain, Los Jameos del Agua (upper left) has a bridge within a collapsed lava tube so you can cross through a cave system that holds a concert hall, an underground pond, and unique albino crab. We have all seen foot paths built over the water or in the woods and built over a ravine. In the Netherlands, there is an eco-friendly bridge (bottom left) made for heavy traffic but built out of Accoya wood. There is even a padlock bridge (upper right), a walking bridge where Russian newlyweds place a lock with their names inscribed upon it and throw the key in the river.There is a rain bridge (middle right) in Guangxi, China. And to cross the great divide, there are sometimes human bridges (bottom right). 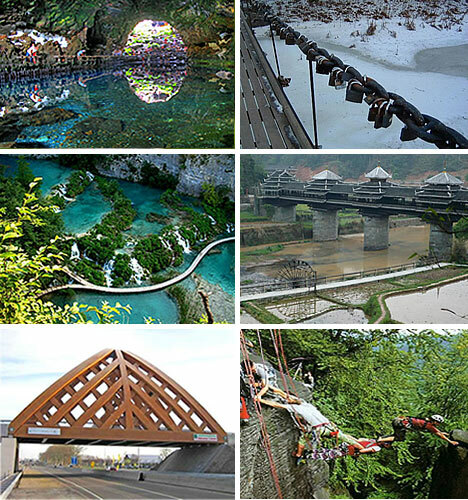 These are tame examples of bridge types. Be it odd or not, if you build a walkway for crossing, someone will use it. To put it quite simply, this bridge is crazy dangerous. Would you be brave enough, or perhaps stupid enough, to cross El Camino Del Ray? Translated, this means The King’s Pathway. It is in total disrepair and is a death trap in Spain. About 700 feet up along the El Chorro gorge, the narrow path is three feet wide in places where it’s not crumbled away. There are hardly any handrails. Can you imagine crossing this, nevertheless filming it as you go? It would either be insane, or insanely fun. Welcome to the jungle, more or less. Far from urban civilization, connecting villages and crossing the strong current in the streams is very complicated.These bridges are anything but sturdy and steady.They bounce and creak and swing under your feet.A man crosses a bamboo bridge (upper left) called a monkey bridge near Phung Hiep, Can Tho, Vietnam. Pakistan has some of the most perilous bridges in the world. In Chitral, Pakistan, a pipeline and pedestal suspension bridge was constructed after a devastating flood.Both the “bridge” and the pipeline (middle left pictures) crossing the Mastuj River are nearly the same size. With no railing for balance and or stability as the weight of the body and the wind wildly swings the hanging bridge (bottom left), a child crosses this dangerous suspension structure as the swollen river ragesless than a foot beneath him. A woman, loaded down with sticks, crosses a primitive bridge made of cane that can be found in Kabua, Republic Of The Congo, Africa. If you journey even farther into the depths of the jungle, you will come upon the village of Cherrapunji, India, where the bridges live and breathe. That’s right, the root bridges are alive. This is one of the wettest places in the world, and the War-Khasis, a tribe in Meghalaya, bends and twists, cuts and forms, growing their bridges. These root bridges are steady and strong enough to support the weight of more than 50 people. 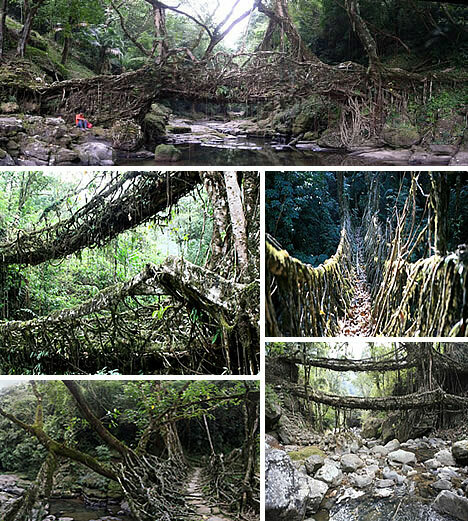 In fact, these ancient root bridges may be over 500 years old and over 100 feet long. They grow stronger each year. The “Umshiang Double-Decker Root Bridge” (middle left) is actually two bridges grown one above the other and is believed to be the only root bridge of its kind. In a hidden Japanese village located in Iya Valley, an area so remote and difficult to reach that it was once a hideout for bandits, disgraced warriors, and refugees, bridges are made of Wisteria vines. On each side of the Iya River, extraordinarily long vines were grown and then weaved together, connecting from one bank to the other. Then wooden planks were woven into the vines and spaced about 7 to 12 inches apart. The architects must have thought handrails were for sissies who wanted a little balance. Three of these Wisteria vine bridges (left top & bottom) remain. Some experts suggest these vine bridges were first built in the 1100s. So basically the wind moves the bridge as your bouncing steps make the hanging and swinging bridge sway more over 147 feet across the river . And if you fall, the water is waiting 4 1/2 stories below. Hanging bridges are also located at Repovesi Nature Park (bottom right) in Valkeala, Finland. 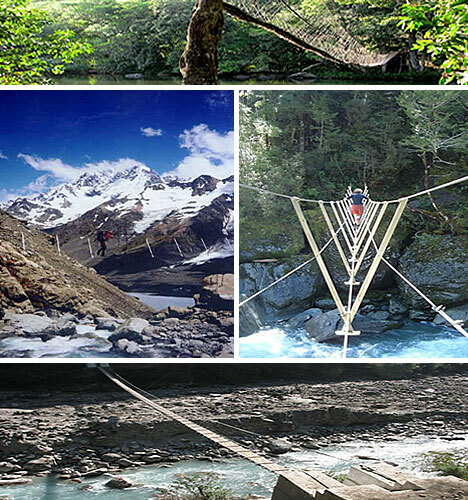 If you have a fear of heights or of bridges, neither of these suspended bridges would probably be to your liking. This deathtrap in Pakistan wins hands down for most dangerous bridge in the world. 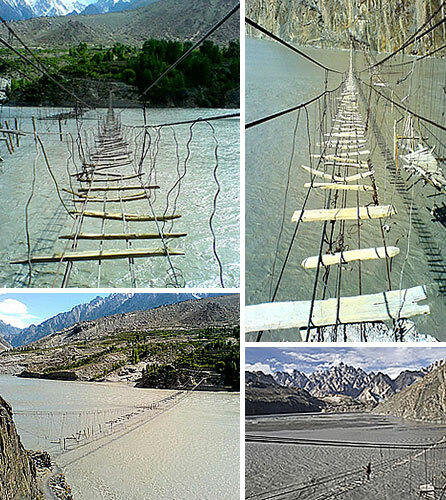 The Hussaini Bridge is a normal way of life for crossing the Borak Lake that resembles a raging river between the Passu Cathedral Mountains.Do you want to cross to the other side (top left)? This suspension bridge is how people get across (bottom right), not daredevils seeking a thrill, but kids, moms, dads, grandparents all use this hanging bridge (top right) daily. Sometimes it breaks (bottom left), but it’s unclear who to call for repairs, as if you could get a cell phone signal out in the sticks of Gojal in Northern Pakistan. Gephyrophobiacs, those who will go miles out of their way to avoid bridges of any kind and who also do not like heights, would either conquer their fear or fall to their demise in thechurning water below. If you are traveling to a rain forest, why not make a point of getting high up within the canopy? 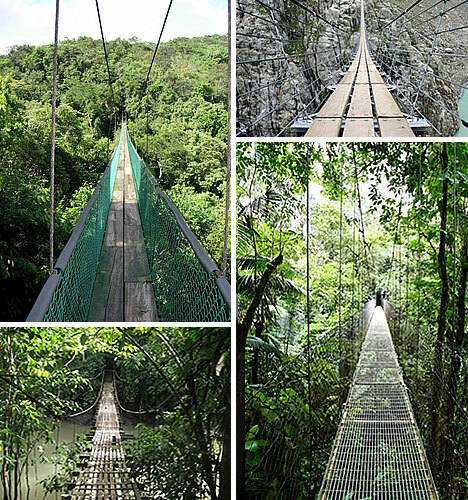 Take the world’s longest canopy walkway (top left & right) that can be found in Taman Negara National Park in Malaysia. Although people travel the canopy bridge for fun, in other places like Beichuan, China, (middle right) a man needing to make it to the other side is traveling over a damaged bridge. 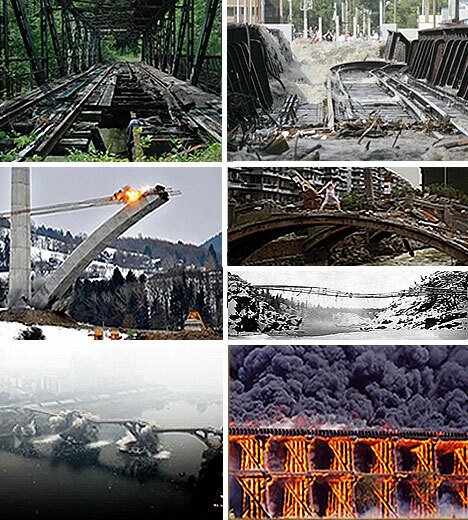 Some bridges practically scream danger (bottom left) before you can even step out on them. 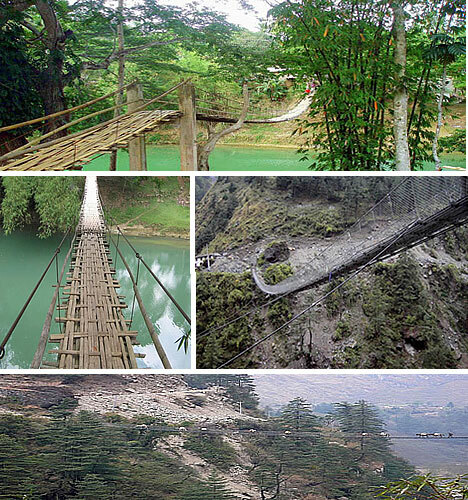 In some areas in the Philippines, a hanging bridge (bottom right) is a means to an end if you need to cross. Deep inside another forest in central Africa, in the southern region of Ghana,look up from the forest floor about 70 feet where you will find Kakum National Park Canopy Walkway. There areseven different spans of suspended bridges that stretch for about a half mile. The walkway is one plank wide. This is a busy tourist stop, so if you run into someone coming from the opposite side, you can wait in the eagle nest (bottom left) for them to get off your path. Ropes suspend this bridge from the top of the rain forest and the lower sides have a rope netting and rope handrails. Regardless, the bridge will sway and jerk up and down beneath your feet. Hanging bridges can be found in many places around the globe such as the Arenal Hanging Bridges (top left & bottom right) in Costa Rica. The longest one is about 328 feet long, suspended 147 feet above the rain forest floor. Costa Rica has six suspension bridges, including the hanging bridge (bottom left) in Drake Bay. In yet another part of the world, there is a high hanging bridge at Trift Glacier in Switzerland (top right). Switzerland has several types of hanging bridges that hikers travel over often. 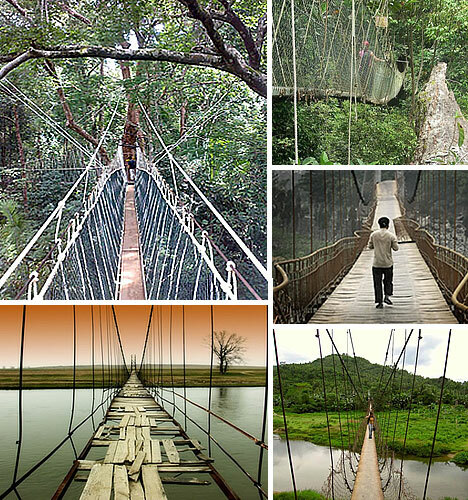 In a land of many suspended bridges, the old wooden hanging bridge (top left) at Thenmala, India seems almost tame. If that is the case, then India has many more hanging bridges (middle left) for you that are no wider than a single wooden board. Or perhaps, if the thrill of an unsteady hanging adventure has worn off, try the harrowing hike at night like at Siju Hanging Bridge once again in India. 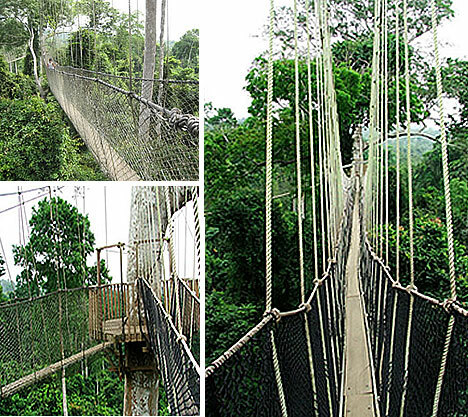 Although we previously talked about Kakum National Park Canopy Walkway, here are a few more views (right top & middle) to better envision the sensation as some dude jumps up and down to cause you to bounce on the board as if it were a trampoline. Times like that make the eagle nest one of the safest places to wait it out. If you don’t want to try a hanging bridge, how about an old Mongolian bridge (bottom right) know as dangerous and located smack dab in the middle of nowhere. What if you had no other option than to cross the unsafe bridge. Would you walk or perhaps be brave enough to take your car across? The hanging bridges above are not tourist attractions, but an actual pathway to and from the other side.Such is the case for Loboc Hanging Bridge (top & middle left), a tropical paradise in the Philippines.The “floor” of the hanging bridges are woven together for added support, yet still manage to shake like an earthquake is happening as you walk over the Lobac River. 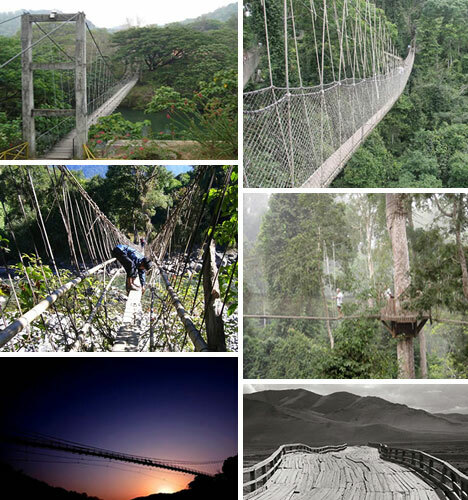 How about crossing a wobbly hanging bridge (middle right) with your pet over a deep and dangerous ravine? In Nepal, both people and goats trek over the Hanging Bridge of Ghasa to cross way above the Burugdi Khola River below. Travel to Antrim, Ireland, for another series of hazardous rope suspension bridges. Carrick-rope-bridge is about eight inches wide. 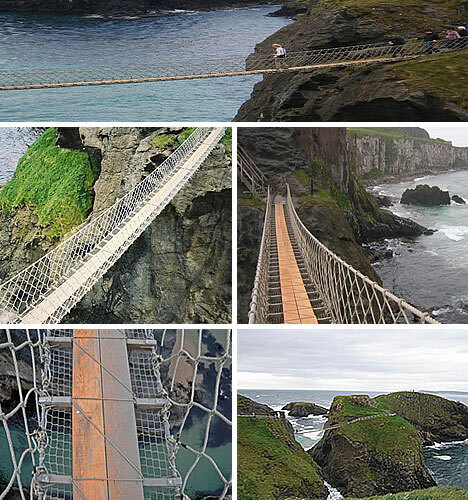 Carrick-a-Rede Rope Bridge is about 65 feet of hair-raising and adrenaline-pumping adventure. It swings over sharp boulders and turbulent water about 98 feet below. Carrick-a-Rede means “rock in the road.” Climbers, fishermen, and adventurers take the rope bridge to tiny Carrick Island. Although no one has officially fallen to their death, don’t take your suicidal friends along this path. Many people who manage to cross to Carrick Island are too terrified to walk back over it again to the mainland and end up paying for a return boat ride. 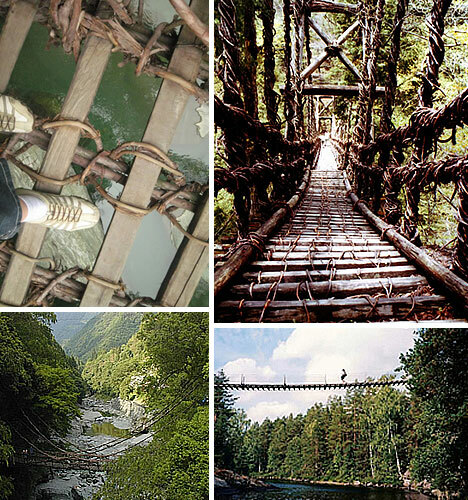 If none of the previous hanging bridges were nerve-racking enough, never fear. New Zealand is the place for you. 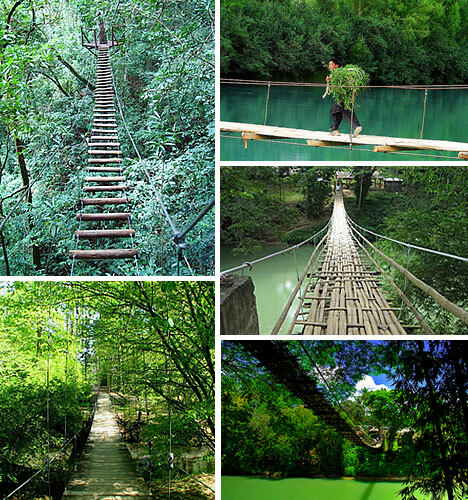 There are many single rope swinging bridges scattered among the vibrant beauty of nature. One little rope (middle left & right) is all there is to stand on. The only difference between the tightrope walkers and visitors traveling across a rope bridge is that these bridges add rope handrails. If you begin to lose your balance, rope swinging wildly back and forth under your feet, you will be glad for the slight precautionary measure. However in Africa, the rope across the water is thicker since it is a single living root. To get there, take the main dirt road from Pita, turn to the right, and step out on the branch to reach the village of Kambadaga. If you still can’t get your thrill on, then think Mount Everest and the Himalayas in Asia. This long hanging bridge (bottom) is only one among others that are about 278 feet up and span 721 feet or more across to the other side.Would that still only provide a deeper thirst for adrenaline? Believe it or not, this jungle playground is not meant to be crossed hand-to-hand like monkey bars, but to be walked upon. This definitely fits in the category of one of the most treacherous bridges in the world. Although cables help support the hanging structure (top left), it would teeter and tremble with every step. There is yet another hanging bridge in Pakistan where a young farmer boy travels back and forth (top right) over the crystal clear waters of Phandar.Whether you are out in the woods during summer, hiking or biking across a hanging bridge (bottom left), or walking over the hanging bridges at Loboc (right middle & bottom), suspended bridge architecture can be found and enjoyed all over the globe. This is not an endorsement to go forth and conquer some of the world’s most dangerous bridges, but it definitely points the way for adrenaline junky travelers.